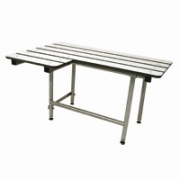 [XPB-957-X] Bariatic Bench Seat frame is fabricated of stainless steel tube, 1-1/4" x 18 gauge sq. main frame with 1" x 18" gauge rd. cross members. The leg is "H"- shaped yoke of stainless steel tubing, 1" x 18 gauge rd. tubing, Heliarc welded to 1-1/4" rd. x 12 gauge frame hinge. The seat is automatically held in a raised position by a stainless cross member attached to the front and rear support legs. When the seat is lowered into its down position the swing down leg automatically aligns the front and rear support legs with the help of the stainless cross member. The seat can support up to 900 lbs when installed properly. Specifications and detailed information available upon request.